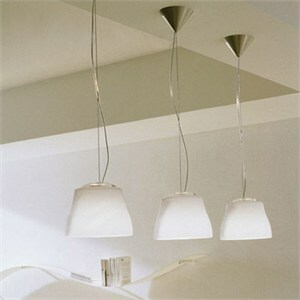 A small-scale pendant design highlighted by a hand-blown glass shade, available in 4 finishes. An incandescent light source provides downward and diffused illumination. Companion pendant, wall, table and floor designs available. A conical canopy in brushed nickel with cable and cord suspends the diffuser which is capped with a poured clear glass detail. Mounts to a standard 4� junction box. 1 x 60 watts, incandescent, G-16, medium base. Canopy: Brushed Nickel. Cord: Clear. Gloss White, Gloss Amber, Satin White, Satin Amber.